12 Best GoPro Alternatives Review by Experts – What is the Most Affordable Action Camera? What is the best GoPro alternative for the decent price? Yes, GoPro action cameras are a so-called standard in extreme or travel video recording. But there are many good and cheap GoPro competitors that show even better results. What are them, let’s find out. Today the action cameras’ market offers a big choice of Go Pro alternatives. In certain circumstances, GoPro itself might not be suitable, it can be too expensive. Mainly, these are beginners who can’t afford this action camera with its expensive camera accessories. That’s why many people are looking for cameras like GoPro but cheaper. Find 12 of them below. As an alternative to GoPro, Garmin VIRB Ultra 30 can certainly boast of good functionality, due to the combination of Wi-Fi, Bluetooth, and PS, plus a microphone built within. What particularly sets Garmin cameras apart from GoPro and those similar is its G-Metrix technology. The four sensors of this model are accelerometer, gyroscope, compass, and additionally a barometer. Altogether, they produce information on speed, duration of being in the air, free-fall acceleration, etc. Check out what is the best action camera for high-resolution 4k videos. Choose a good action camera for affordable price to record breathtaking travel videos in motion. I found the 4K Ultra HD video especially cool. Certainly, photos are equally clear. Among the disadvantages, you will find short battery life when filming Ultra HD footage that will unlikely exceed 73 minutes. This Garmin Virb camera is an equal competitor to GoPro and Sony. Such features as G-Metrix, 4K resolution, verbal commands and color sensor screen set it high as the best Go Pro alternative in my list. The next alternative to GoPro camera, Yi 4K+, claims to film 4K at 60fps, which sounds great but comes with some drawbacks. You can opt for recording it in 48fps or 30fps to avoid them though. At the highest rate, the gadget produces sharp and contrast results with saturated colors. When I was shooting hand-held, I noticed the video getting choppy, which resulted from low frame-rate (being most noticeable in panoramic mode) and the stabilizer being off at any rate higher than 30 fps when filming 4K. Read about the cheapest 4k cameras you can use to record beautiful and high-resolution videos of your trips or extreme sport activities. The stills taken with Yi 4K+ are pretty nice if you don’t mind the wide angle. That can force you to get uncomfortably close to the desired object. The image turns out reasonably sharp. The fisheye effect was subtle, but even that can be easily edited afterwards. It is handy in use, especially I like its flip-out display. TG-Tracker's exposure is well balanced, grasping the fine detail in 30fps 4K. The contrast, though, is high set, and the dynamic range is somewhat flattened both on the shadow and the highlight end. I distinguished the quick exposure adjustment as I was shifting between bright and shaded spots, and the auto white balance was equally good. Moreover, TG-Tracker gets a point for simultaneous adjustment of exposure and color, which is not common among low-cost models. Among those currently available, Olympus TG-Tracker just might be the best GoPro alternative for $200. Its sturdy and water-resistant design with Steady Grip, small screen, button layout makes it a good choice for hiking and extreme water sports. It could equally well fit families and sports enthusiasts. Bandit gives out fantastic 4K UHD video sufficiently boosted by its impressive image sensors and assisted by resolution quality. With its sharp and clear but still natural-looking video, it can be named one of the best GoPro alternatives. Equally, the Burst photography mode can compose an impressive video clip out of the 10 shots taken in 1-2 seconds. In practice, you pre-set an interval and the action camera compiles a time-lapse movie for you out of the shots it took. The shot frequency can be spread anywhere between 5 and 60 seconds. This way, you can get on a peak to capture stunning dusk or dawn, go to a beach to shoot waves or record any sports activities you like. Using this camera on good mounting, I managed to receive proper footage. The results of hand-held filming or other shaky conditions look jittery though. For having a price-tag so low, it gives satisfactory quality and can proudly bear the name of the best GoPro knockoff. Having used GoPro Hero 2 before, I felt confident with the similar controls and menus and knew what to do. Certain options were goofy but still everything was intuitive. Flipping the view orientation showed a glitch though, making the controls look backwards as if everything flipped but their functions. View more about the best action cameras under 100 dollars if you need an inexpensive but good quality camera for your travel videos. The remote enclosed surprised me, it works really well. Equally impressive is the back screen. There were two batteries provided but only half charged, forcing me to juice them up before use. The accessories were alright. Overall, it’s a usable cheap GoPro alternative. I’d recommend Fitfort for fun and shooting short travel videos. When using it outside at a clear sunny day, you get a sharp and realistic image with the 4K at 30fps that will adjust exposure as you move. Even handheld it produced stable footage with low distortion level (some fish-eye was still there). But horizontal pans proved more difficult to do on the level. Though you expect a pan to have some jumps and jerks normally with such kind of equipment, this GoPro alternative had them all too noticeable. Zoom was unable to focus on certain objects. The same was with low light shooting, resulting in a picture full of noise. Filming full HD at 60fps, though, solved the problem with pans, making them noticeably smoother and better detailed. Then the 720p at 240fps was hard to watch, looking flat, blocky and blurred. As for the image stabilization, FDR-X3000R's technology proved efficient, but the results left me feeling somewhat glassy-eyed which is a considerable drawback. This Olfi action camera has the new Sony Exmor-R CMOS sensor, which is awesome. You will enjoy juicier colors and a reduced shake improved by the gyro stabilizer. I attached it to a bike when riding on broken grounds and the footage was nicely stable. This cheap GoPro alternative even offers you to select the intensity of colors or keep it in post using the 'Flat' option. The latter is sure to satisfy you on clear and bright days. This device won’t reach such light/shadow distinction as GoPro Hero 5, but the end result is still nice. You can tinker with exposure settings, 3 metering modes, 5 white balance set-ups and ISO limits. The inevitable fish-eye distortion always takes place when shooting in wide angle that can be adjusted through a designated setting. You can take your stills in the range of 3-16MP. The available HDR option does a good job in capturing detail under highlights and shadows. I tried shooting in all resolutions and the image quality held out, keeping up saturation, tone and detail. Even when shooting conditions were bad, like cloudy weather or indoors, the result was still nice: you got detailed picture and lifelike color, tone and contrast. If the sunlight is too sharp, though, I noticed some loss of definition on large areas of high saturation. If you don’t overtax Drift Stealth 2, the raw, unedited results keep the high contrast and vibrancy pleasing to the eye. The image remains smooth in motion and it doesn’t look like any frames get dropped. Even when going faster, there was no noticeable pixelation. The lens is another good feature providing that typical look action cameras are cherished for. I didn’t notice some blurring and fringing at the edges of the frame. All in all, the camera stands out among the best GoPro alternatives due to having a rotating lens and being small and compact enough for easy mounting. Additionally, the built-in Wi-Fi, the 3h charge duration, and car DVR are nice bonuses for extremals. Having a 14-megapixel sensor and an adjustable wide-angle lens, this cam allows choosing one of three fields of view options. It is possible to fix it up to 166 degrees and shoot without image editing. The sensor can take sharp and vivid photos. One of the most outstanding features of Sjcam SJ5000 is a burst mode. You can take three images per second, which makes it easy to shot fast-moving objects. SJ5000 has a Wide Dynamic Range which allows shooting stunning views with high-quality color rendering. This device is great for underwater adventures because it features a durable and smooth waterproof case along with the capability to operate down to 90 feet. 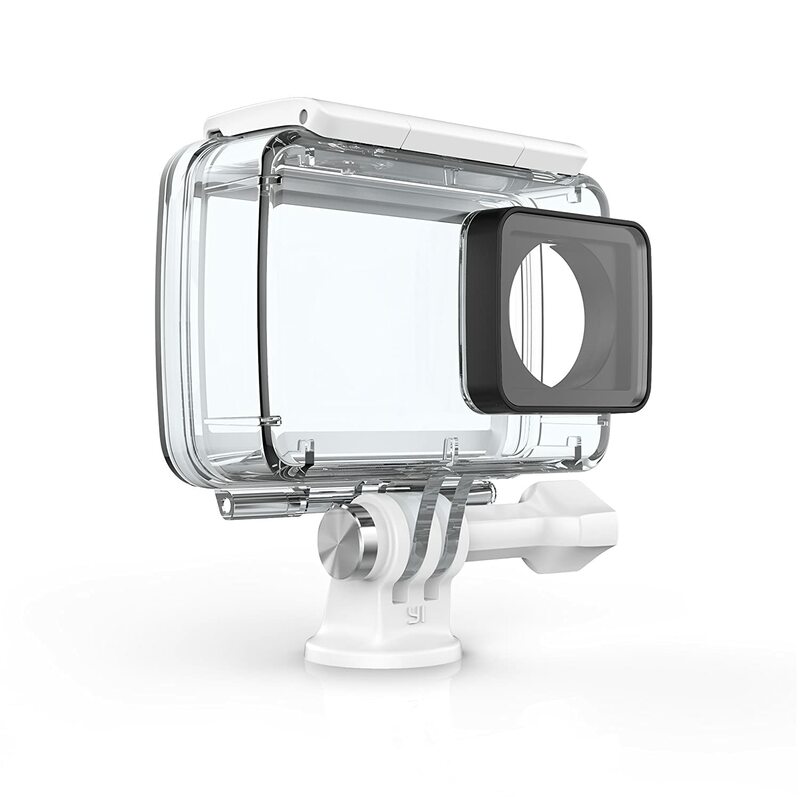 This action camera has a 2-inch LCD screen to control the shooting and view images. The battery life is quite long, approximately 90 minutes. That is enough to take a lot of shots during the journey. It is excellent for recording sports events, races and any other moving targets which makes it the best GoPro alternative for $100. Xiaoyi Yi is distinguished by its excellent video quality which makes it the best GoPro knockoff. The colors have a good balance and saturation as well as excessive contrast which is normal for up-to-date low-cost cameras. Motion reproduction is an essential option if you want to record slow motion videos. It is possible to film smooth and clear videos that are as good as those GoPros show. The disadvantage of Xiaoyi Yi is a low light performance, but this is a drawback of all action cameras. However, it perfectly controls the noise and records high-quality videos indoors in dim light. Its small lens is capable of capturing a good, clear image throughout the frame. Though if to take a closer look at the edges of the frame, you can see some insignificant softening and chromatic aberration. Sony HDR-AS200V/W film dynamic and professional videos. Furthermore, this excellent Go Pro alternative has a slo-mo option. The resolution in this mode is quite lower (up to 240p), but it is enough to produce impressive short movies. The most remarkable feature of this device is steady shot stabilization. It is possible to record smooth and professional videos due to the smart software which neutralizes the shake and your turns. Thanks to this feature, I can record videos while riding a bike or in the car, etc. In addition to incredible image resolution, Sony HDR-AS200V/W has a first-class in-built microphone. Thus, it simultaneously shoots professional-looking videos and records high-quality sounds. This model has a super wide ZEISS lens that makes it possible to increase the perspective. The lens provides a substantial perspective up to 170-degrees, so you can easily take fantastic panoramic pictures while travelling. Polaroid Cube is the best GoPro alternative for the decent price, mainly, because it shoots videos of good quality and is inexpensive. However, the color range isn’t as bright as I expected. I would like the details to be sharper. But in spite of the size, the footage I shot is quite good. It is better to put the Polaroid Cube on something stable. The main miss of this cam is that it takes noisy pictures in low-light situations. So, I wouldn’t recommend to use it as a main camera because even in small or actual size it is possible to catch sight of some defects. The images aren’t awful, but also they aren’t amazing. In total, I like the video quality of this cheap GoPro alternative. I enjoyed the idea of magnetic mounting, but I would like the developers to add some kind of alternative mount (there is a magnetic plate attached to the package that can be saved and reused). How to Choose the Best GoPro Alternative? All action cameras differ in their size and the set of functions. And often choosing the right model is not easy at all. That is why we have gathered all the main factors for you to pick up the most suitable device. Have in mind what to look for while choosing the best GoPro alternative. FPS affects the smoothness of the video. The good action camera must be capable of shooting above 7 fps. If it shoots higher, then it is even better. Most Go Pro alternatives are able to produce between 30 and 60 fps. If you want to record some sports events, you will need to slow down your videos. There are models that have a frame rate of 120 fps and 240 fps. The bigger frame rate value is, the slower effect the camera makes. Furthermore, it is better to pick up the device with a slow-motion mode. It allows slowing down the video material after filming. Up-to-date GoPro alternatives are able to shoot in 4K format. Just imagine, this is four times bigger than the resolution in Full HD. Keep in mind that if you want to process the videos in 4K, you should have a computer with high performance. If you have a video camera, it will be reasonable. Full HD or 1080p resolution makes it possible to shoot excellent and dynamic videos. They can be easily processed by the PC. If you want to film videos for vlogs, this resolution will be the most appropriate one. 720p format is frequently used in many frames for shooting at the max frame rate to receive the effect of slow motion. The most important feature you should mind while choosing a GoPro alternative is battery life. The longer it is, the longer your camera will operate on a single charge. Most of the modern action cameras can be charged with external battery supplies. Nevertheless, not all of them have extra batteries and consequently must be purchased individually. When you shoot under the rain, in the swimming pool or in the sea, it is better to have a water-resistant camera. Usually, all action cameras, which are GoPro competitors, boast good quality, but dust or water can get into the most unexpected places and in an inopportune moment. It is worth saying that the majority of cams on my list are water-resistant only with an extra case. So, it is better to buy this accessory when you shoot underwater and go long distance diving. I recommend purchasing the device with good image stabilization to get a smooth video without being afraid of shaking your head. If you are going to wear your cam and shoot while snowboarding or riding a bike, you will see all the advantages of the image stabilization. Mind that if your camera has such a feature as Built-in Electronic Image Stabilization (EIS), it might be rather expensive. Nevertheless, you can buy the advanced Steadicam tripod, which guarantees the same position of the device during video recording, even in shaky shooting conditions. A lot of regular action cameras have a very wide FOV from 140 to 170 degrees. Some models have only one field of view, while others have several viewing modes. It is worthwhile to note that in most models, the viewing angle is pretty wide. It causes a fisheye effect. Fortunately, there exist a lot of image post-processing software that can fix this flaw. If you are going to record extreme videos in the water, snow, mountains, etc. you will definitely need additional camera accessories to avoid damaged and difficult weather conditions. If you are planning to dive, you will surely need the durable protective case for your camera. You may also need special inserts. They take in moisture inside the case, prevent the lens from water entry and protect your footage. An SD card is an indispensable item for the camera. I highly recommend buying the largest memory card your device will accept. The last thing you want is to find out your SD if full midway upon your adventure. It allows you to stabilize the camera to prevent shaking. It is a must for those who shoot sports events, for professional videographers and selfie lovers. If you are going to record time-lapse videos, you surely need a tripod. I recommend the one from Gorillapod. Having an integrated ball head, it is adjusted effortlessly and fast. Moreover, it is possible to get a horizontal level. You can install it anywhere, for example, on a tabletop, a rail or even a tree without any difficulties. It is necessary to have this accessory for your action camera. I should point out that a lot of original GoPro mounts will fit conventional action cameras.